It just makes my little retro recipe heart sing! 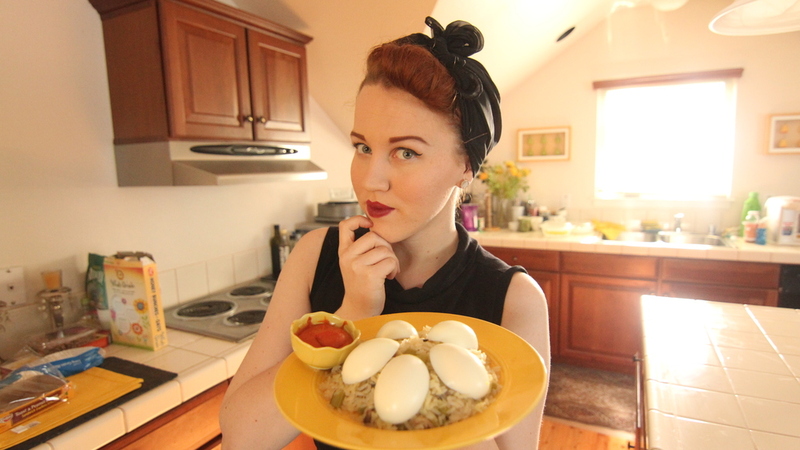 Anyways, this recipe was really simple, but it’s not the traditional deviled eggs that you think of! 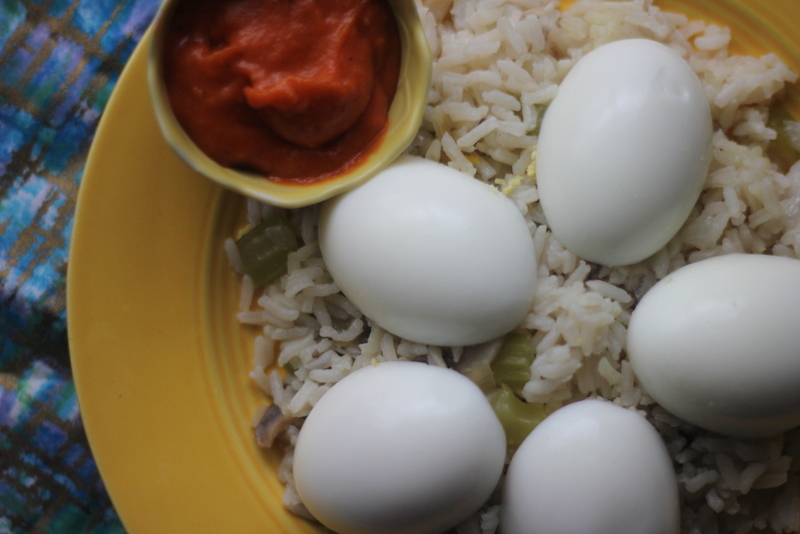 It’s basically rice pilaf with hard boiled eggs on top. Now, if you watched my video (which by the way….go watch the video!) you’ll see that I said in the title it said “creole” rice… but when it came to the ingredients it said “seasonings” and for some reason I didn’t put two and two together! So at the last second I decided to add creole seasoning to the tomato sauce. 1. Chop onion coarsely with celery and pepper, removing core and seeds. 2. Fry in the butter for 5 minutes without browning. 3. Add sliced mushrooms and rice, cook for further 4 minutes, add stock. 4. Cover pan, cook for 20 minutes or until no moisture remains. Season well. 5. Meanwhile hard-cook the eggs and make the sauce. 6. Melt the butter, stir in flour, cook for 2 minutes, remove from heat. 7. Gradually blend in tomato juice, simmer until thickened, add remaining ingredients, and cook for 5-10 minutes. Season well. 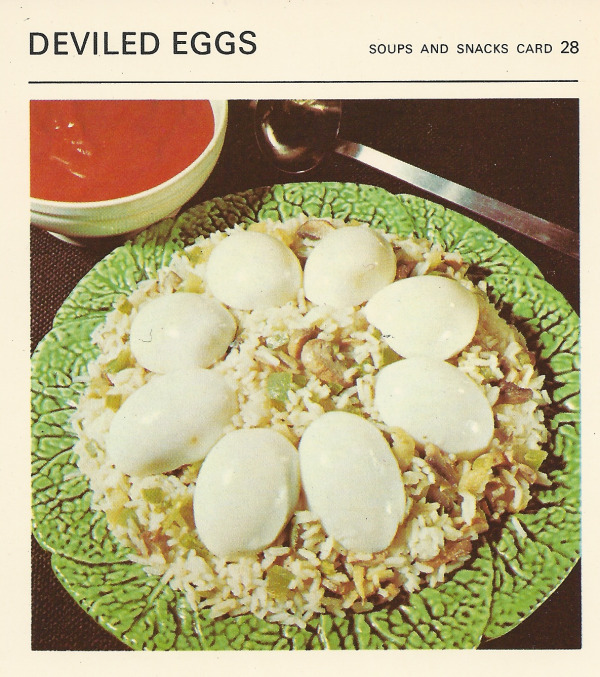 TO SERVE: Put rice into a hot dish, top with halved shelled eggs. Pour sauce over or serve separately. TO VARY: If green pepper is not available, use canned pimiento. Omit mushrooms and add chopped bacon. MISS SEMI SWEET FIRST – are you ready for this! I mean honestly, that’s probably not that surprising because it’s rice and eggs and tomato. How could that be bad? Actually, forget I said that…I know it’s possible. Imagine it with jello! 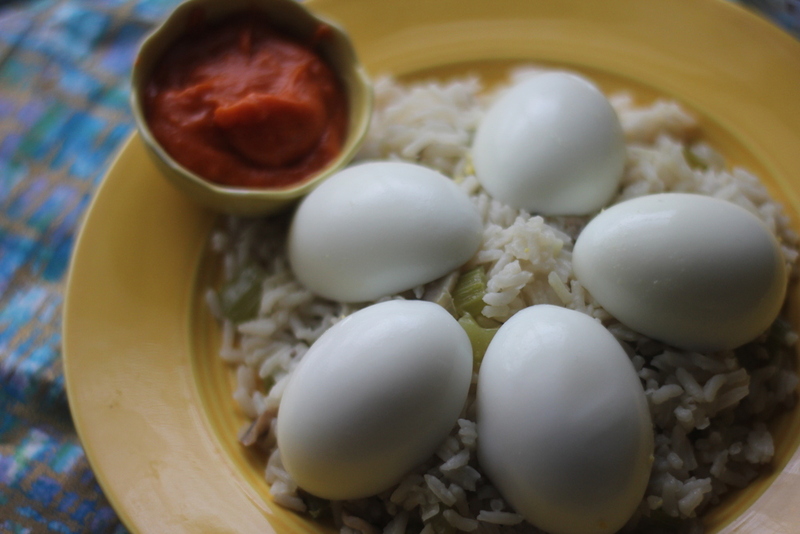 If you google, Creole Rice and Eggs you’ll get a bunch of delicious looking recipes too…just in case you cared to try!